It is late July in Las Vegas and the weather is hot, humid and sometimes plain uncomfortable. It is difficult to spend a lot of time playing outside when it is like this. I prefer to keep on getting out and enjoying myself withouyt the confinement of four walls. But it means making sure to DRINK, DRINK, DRINK or find myself spread eagle on a trail somewhere like a bad episode of Death Valley Days. The last week or so of July always feels like summer is endeing. This, despite the fact that the weather will not cool for a couple of months. The best of kayaking for the summer is yet to come and the days are still nice and long. 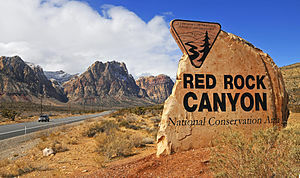 I still like going to Red Rock Canyon National Conservation Area when it is hot, even though people say it is crazy to do it. But I am not the only one because every weekend there are bikes, hikers, climbers and walkers all over that place. It is only Tuesday, but my mind is outside playing, and I cannot wait to get there! Posted on July 26, 2011, in Climbing, Hiking and tagged Death Valley Days, Las Vegas Nevada, Parks, Red Rock Canyon, Red Rock Canyon National Conservation Area, Travel and Tourism. Bookmark the permalink. Leave a comment.